Modern engine computers (ECU's) have taken over many of the controls of all aspects of engine management from timing to fueling and more. This actually means you get better power, a cleaner burn and more reliable engine but it does not mean the end of tuning as this program or map can be easily upgraded in most cars. See our article on remapping the ecu for more information about how the engine management maps work. Chip tuning is a term used very loosely to describe any process of remapping the cars engine. To choose between a remap, replacement chip, new ECU or piggy back join our forum and discuss your options with our friendly members. In this article we shall focus on the specific act of "Chip tuning" and not dwell too much on remaps although both are very similar in nature. 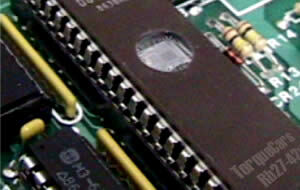 The term probably stems from the early days were chips could not easily be reflashed and updated. Now with some locked ECU's chip removal and replacement is once again becoming an option. The only option in these cases was to literally replace the chip. Often these would need to be soldered and could be quite fiddly and, due to the delicate nature of chips, prone to failure. Chip replacements were the only way to change a cars mapping but now with standardised diagnostic ports it is much easier. It is possible to buy performance chips that you can install in your car yourself or specialist companies offer a replacement service where they supply and fit the performance chip. These are often off the shelf maps designed to suit a wide range of cars. They do offer benefits over standard but as with all generic mods, they can never compete with a custom map designed specifically for your car and driving style.